The Resonance Radio Orchestra, under the conduction of Alfredo Genovesi, provide an audio backdrop to an interview between Lembit Opik MP (chairman of the Join Parliamentary Committee for Near earth Collision) and Nick Spall. 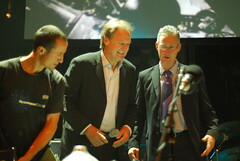 More photos of the event at the Roundhouse Theatre in Camden can be found on flickr. This entry was posted in lmc on October 10, 2006 by sal. The Resonance Radio Orchestra presents a new radiophonic work based on the life cycle of the mayfly. The score is written by Veryan Weston, the text by Ed Baxter. As well as the two dozen instrumental performers (whose instruments include laptop, vibraphone, sound effects etc), a special guest actor takes the lead role. This entry was posted in lmc on June 22, 2006 by mr_trick. The most recent series of â€œan hour of capital stuff,â€ presented by Lord Murk and Nobby. Produced by John Nicholson for Resonance104.4fm, London Revisited is an esoteric guide to the cityâ€™s hidden histories. Episode 11: An interview with Lloyd and Dorothy Moote, authors of a medico-historical study of The Great Plague: the Story of Londonâ€™s Most Deadly Year. Plus the regular serial, â€œCrimes and Damned Crimes,â€ which dissects Peter Ackroydâ€™s distorted mythologising of the city; On The Barrow; Roger Dobsonâ€™s Lost Writers of London; Reading London; and Tim Marsâ€™s audio cartoon, Meeting with Remarkable Men. This entry was posted in lmc on January 25, 2006 by mr_trick. This entry was posted in lmc, Uncategorized on January 17, 2006 by mr_trick. Episode 8: London as the New Jersuselam: an interview with Adrian Gilbert. Plus the regular serial, â€œCrimes and Damned Crimes,â€ which dissects Peter Ackroydâ€™s distorted mythologising of the city; On The Barrow; Roger Dobsonâ€™s Lost Writers of London; Reading London; and Tim Marsâ€™s audio cartoon, Meeting with Remarkable Men. This entry was posted in lmc, Uncategorized on January 9, 2006 by mr_trick. Episode 7: Interview with leading London writer, Ed Glinnert. Plus the regular serial, ‘Crimes and Damned Crimes’, which dissects Peter Ackroyd’s distorted mythologising of the city; On The Barrow; Roger Dobson’s Lost Writers of London; Reading London; and Tim Mars’s audio cartoon, Meeting with Remarkable Men. This entry was posted in lmc on December 21, 2005 by mr_trick. This entry was posted in highlights, lmc on November 29, 2005 by mr_trick. Episode 6: Featuring an interview with London salvage magnate, Adrian Amos (of ‘Lasco’). Plus the regular serial, ‘Crimes and Damned Crimes’, which dissects Peter Ackroyd’s distorted mythologising of the city; On The Barrow; Roger Dobson’s Lost Writers of London; Reading London; and Tim Mars’s audio cartoon, Meeting with Remarkable Men. This entry was posted in highlights, lmc on November 21, 2005 by mr_trick.